In a district drawn for Democrats, incumbent Congressman Joe Walsh (R-Ill.) lost to challenger Tammy Duckworth by 10 points last night in one of the country's most watched -- and bitterly fought -- congressional races. By 10:12 p.m., the Chicago Tribune declared Duckworth the winner and Illinois watched Walsh’s reign in Congress come to an end. And after months of back-and-forth between both candidates splashed all over national news, it seemed like this race was going to last forever. Walsh's election night party began at Medinah Shriners in Addison and the room was filled with supporters as politically charged as the man himself. Supporters William and Dale Lewis, a married couple from Woodstock, IL, had a lot to say about the Democratic Party and likened them to Socialists or Communists. But fanatical supporters that follow Walsh didn’t seem to cut it. 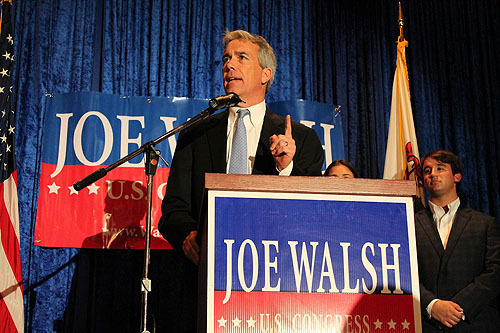 Walsh, an enthusiastic Tea Party freshman, has spent a lot of his time in the limelight during his term as congressman. Prominently displayed in the media for his extreme right wing stance on social issues, Walsh isn't afraid to speak his mind. After his most recent debate against Duckworth on WTTW-Channel 11’s "Chicago Tonight," he received a lot of complaints about his “no exceptions” comment on abortion. "With modern technology and science, you can't find one instance," he said. "There's no such exception as life of the mother, and as far as health of the mother--same thing." The next day, he changed his tune a bit stating that in the “very rare” case where an abortion is needed to save the life of the mother, he would support the decision. With only a few weeks until Election Day, it was not a smart move by Walsh and was just the thing to help seal the Duckworth deal. A room full of buzzing conversation and excitement quickly ended last night when it was announced that Duckworth had secured the spot as congressman in the 8th district. There was a lull among his supporters as his Chief of Staff, Justin Roth circled the room preparing the stage for Walsh’s speech. After waiting for 15 minutes, Walsh came up on stage and spoke to his supporters, staff, media, and family and gave a heartfelt speech, refraining from any snide comments about Duckworth and her supporters. “I also told Ms. Duckworth that my office, my congressional office will do whatever we can to help with the transition when she assumes the responsibilities on Jan. 1 as the new congressman from the 8th district,” Walsh said. His speech was an empowering contrast to the negative persona dictated by his campaign for re-election. Walsh, as passionate as ever, guided his supporters with sermon-like direction. "I want you to wake up tomorrow, I want you to wake up a week from now, I want you to wake up two weeks from now, I'm gonna wake up and I want you to remember what we're fighting for," Walsh said. "And I want you to walk with me wherever we must walk together."